Yingzhen Li, John Bradshaw and Yash Sharma. Are Generative Classifiers More Robust to Adversarial Attacks?. ICML 2018 TADGM workshop (oral). 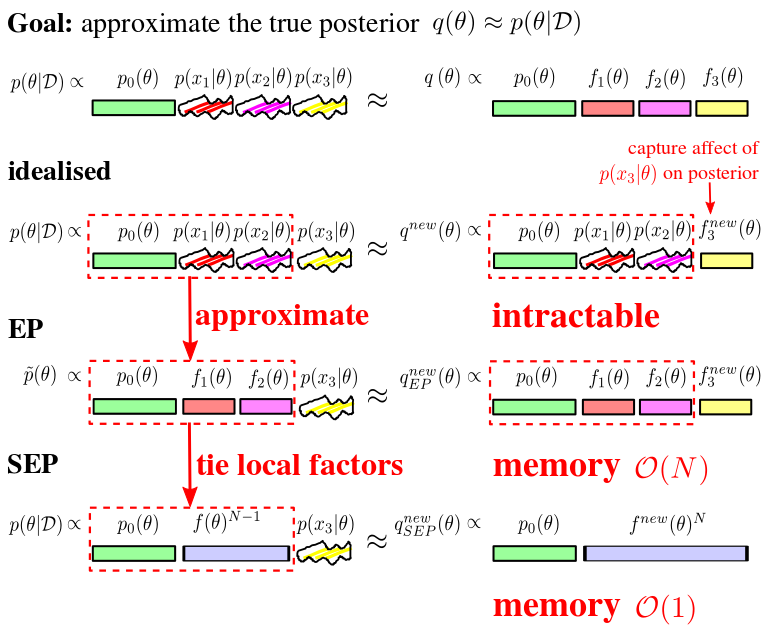 Amortised MCMC is an extremely flexible approximate inference framework. It is completely up to you to specify the sample generator, the Markov chain transition kernel, and the update rule for that generator. 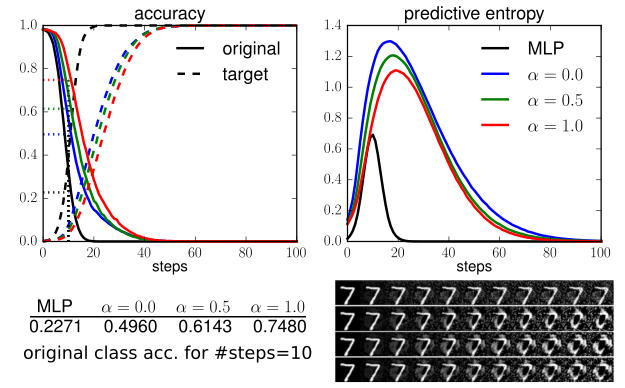 In the experiments, we specifically defined the sample generating process by warping simple randomness through a deep neural network, and the update rule was a GAN-like method but acting in latent space. I'm very excited about this work and would like to see extensions to discrete distributions as well! Recently people are very excited about meta-learning algorithms that are then used to optimise ML models. However naively proposing an arbitrary neural network to do sampling is almost guaranteed to fail. 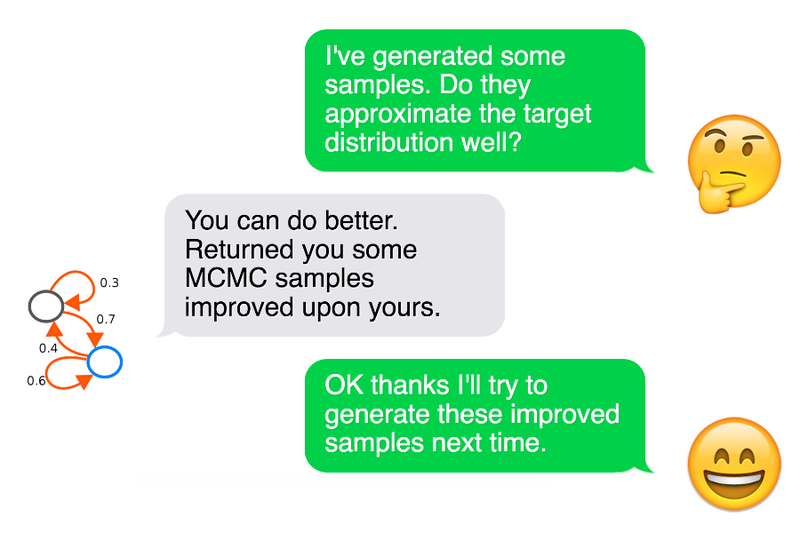 So we really want to meta-learn an MCMC sampler that is provably correct (i.e. 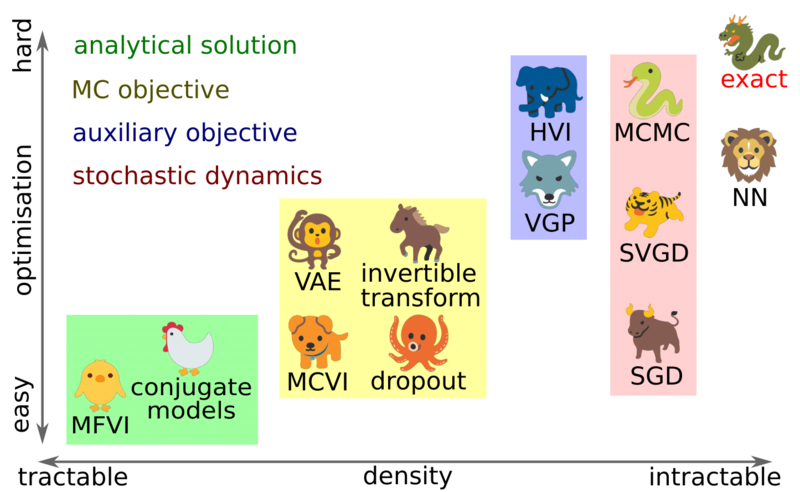 the stationary distribution is the target distribution), and we build on top of a seminal work on SG-MCMC to combine the flexibility of neural networks and Hamiltonian Monte Carlo. While there are quite a few recent papers talking about learning disentangled representation using some new loss function, I thought: why not just go back to the graphical model land, and directly enforce disentanglement in model design? So there you go a minimalistic generative model for disentangling content and dynamics in a sequence. We have speech recognition example in the paper as well, and we also show using stochastic dynamics could potentially achieve better compression. Part of this project was done as an intern at Disney research. 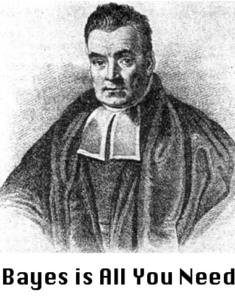 "Bayesian Inference is **the natural choice** for online/incremental/continual learning." Conceptually this is nice, but you know deep learning engineers wouldn't bid for it as exact Bayesian inference takes "forever" to run. In this paper we just use variational Bayes to make it tractable and easy to implement for continual learning of deep learning tasks. For both supervised and unsupervised learning. 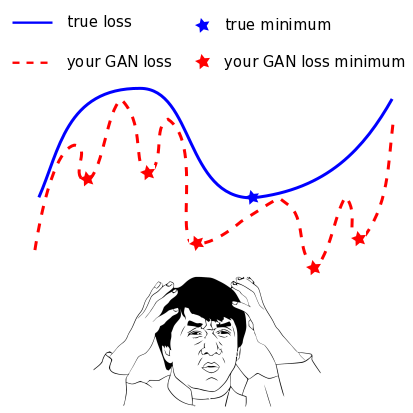 One of the main reasons why people now are super excited about GANs is that the generative model is implicitly specified by a neural network warping simple noise vectors. 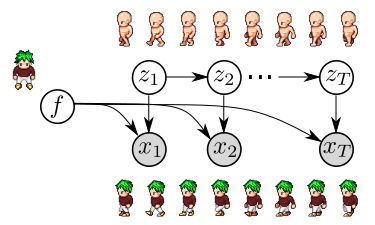 However, applying probabilistic learning methods to these models requires severe approximations, where an overfitting estimation to the optimisation objective can lead to arbitrarily bad models. In this work, we explore an alternative route -- approximating the gradient function -- for training implicit models. 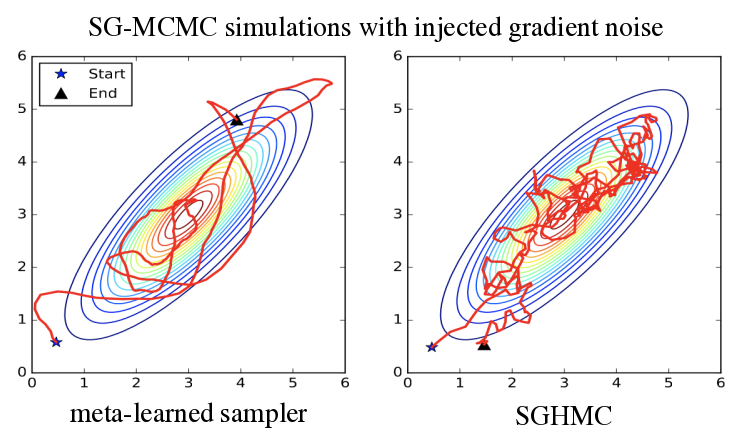 We demonstrate the efficacy of our method with some exciting applications: meta-learning for posterior samplers, and improving GAN's sample diversity. Show me your loss function, and I will return you an objective function that trains a Bayesian NN with BB-alpha and dropout! 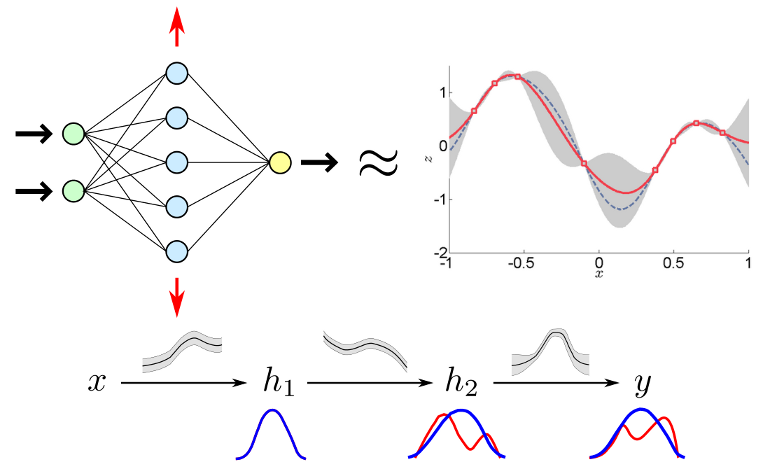 We extended the dropout variational inference idea to minimising alpha-divergences, and the proposed re-formulation can be implemented very efficiently with any high-level deep learning framework. You can try any dropout techniques (Bernoulli, Gaussian, Concrete, dropConnect, and even stochastic depth) and select the best alpha for your need. As a side-project we also showed that Bayesian NNs can be used to detect adversarial examples, both in untargeted and targeted attacks. 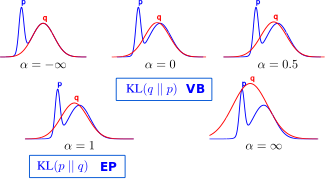 The goal of approximate inference is to get accurate posterior approximations in a fast way. However the definition of "accurate" really depends on what you actually want. 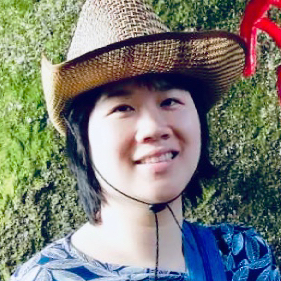 You as the user specify the approximation family that suits your constraints, and my job here is to provide you a flexible inference framework that allows you to fine-tune the alpha parameter to get the best for your need. No painstaking derivations again and again! Under some conditions, a Gaussian process model can be viewed as a one-hidden-layer neural network with an infinite number of hidden units. So it makes sense to make GPs "deep", and there you go the deep Gaussian processes. However inference for deep GPs is non-trivial unlike regular deep neural networks, so this paper introduces a scalable inference method for them using Gaussian propagation. GPs are state-of-the-art regression models and our contribution make them even so! It would be fantastic if we can get the "lion king" (neural network transform) to help beat the "demon dragon" (exact posterior)! In this preliminary work we discussed several potential proposals to train a "wild approximation" in which prediction is tractable but the density of q might be difficult to evaluate. We presented it at the NIPS 2016 approximate inference workshop with preliminary results for toy examples and generative models. Approximate Inference: New Visions. PhD in Engineering, University of Cambridge, June 2018.